African cichlid males are a model species for studying social status due to their elaborate social organization, where they reversibly switch between a dominant and subordinate phenotype. It has been previously demonstrated in an open field test that subordinate males exhibit less locomotor activity and anxiety-related behavior than dominant males. Interestingly, females develop a male-like social hierarchy when housed in the absence of males. Thus, it was hypothesized that females from female-only social communities would show decreased locomotor activity and increased anxiety-related behaviors, similar to their male counterparts. Understanding how social life affects brain function at all levels of biological organization is fundamental to tackle the causes and consequences of affective disorders, such as depression and anxiety. African cichlid fish Astatotilapia burtoni, have proven to be ideal subjects for social behavior research due to their phenotypic plasticity i.e., individuals reversibly transform between a dominant (DOM) and subordinate SUB) social status, demonstrating both physiological and behavioral changes in each phenotype (Hofmann, 2001). DOM males are larger, brightly colored, and vigorously defend territories to attract females, whereas SUB males are smaller, pale, and reproductively suppressed. DOMs frequently chase other males across the habitat, with SUBs responding with fleeing and social withdrawal. Experimentally, SUBs show an increase in anxiety-related behaviors such as thigmotaxis (wall hugging) and decreased locomotor activity when swimming in a novel environment (Neumeister et al., 2017). The finding that in the absence of males, females develop male-like DOM and SUB phenotypes, was used to further test for a link between social defeat and anxiety in female A. burtoni, (Renn et al. 2012). DOM females exhibit bright coloration and are larger as compared to SUBs and to females from mixed-gender communities. DOM females express aggressive behaviors more frequently, and have higher blood androgen (testosterone) concentrations, which is possitively correlated with dominancy in males (Renn et al. 2012). Thus, it was hypothesized that social defeat in females will produce similar behavioral differences to those expressed by their male counterparts, i.e., differences in locomotion and anxiety-related swimming behavior. through conditioned water adjusted for temperature (±27 oC), conductivity (±600 μS), and pH (±8.5). Terracotta flower pots served as territories. At adult age, males were removed from the community to obtain a female-only community. Females from mixed-gender communities were included as controls; since they were housed with males, they did not show obvious DOM and SUB social behaviors. 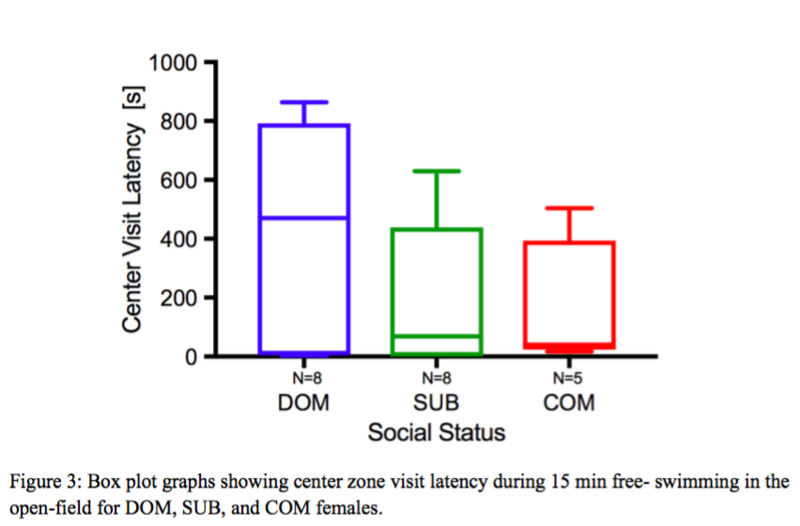 Social behaviors were quantified (10 min, twice a week for four weeks) to categorize individual social status of females in the female-only tank (Neumeister et al. 2017). A behavioral ethogram was used, scoring chases, bites, pokes, threat displays, and carouseling as DOM behaviors, and fleeing as a SUB behavior. A dominancy index (DI) was calculated by subtracting the total number of observed SUB behaviors from the total number of observed DOM behaviors. DI categorizes social status into two groups, with DOM fish, scoring > 0, and SUB fish scoring < 0. To test free swimming behavior in the open-field, individual females were carefully transferred from the female-only home tank into a circular experimental tank (diameter 76 cm, height 20 cm). Conditions were set to model the fish’s home tank, with temperature (±27 oC), conductivity (±600 μS), and pH (±8.5). A black mesh cylinder defined the arena (diameter 30 cm, height 20 cm) and reduced visual disturbances, however the clear glass bottom of the tank allowed for video acquisition. After the fish had been carefully introduced into the arena, a 30 minute video was recorded (25 frames per second) using an OLYMPUS i-speed RVS-773617N camera. Videos were analyzed (1 frame per second) using the automated tracking software BIOBSERVE. To allow the fish to acclimate to the novel environment, videos were analyzed during the second half of the 30 min recording period (minutes 15 to 30). To measure anxiety- related behavior such as thigmotaxis (wall hugging) , the arena was virtually divided into an inner (center) and outer zone, which allowed for the quantification of center zone visit latency, frequency and duration. To measure locomotor activity, total distance traveled (TDT) for each fish during the 15 min period was analyzed, and normalized to fish body lengths (bl) for a scaled comparison of females with different body sizes. Additionally, the software calculated overall activity, defined as swim velocities greater than 0.05 cm/s. Statistical analyses were completed using GraphPad Prism. 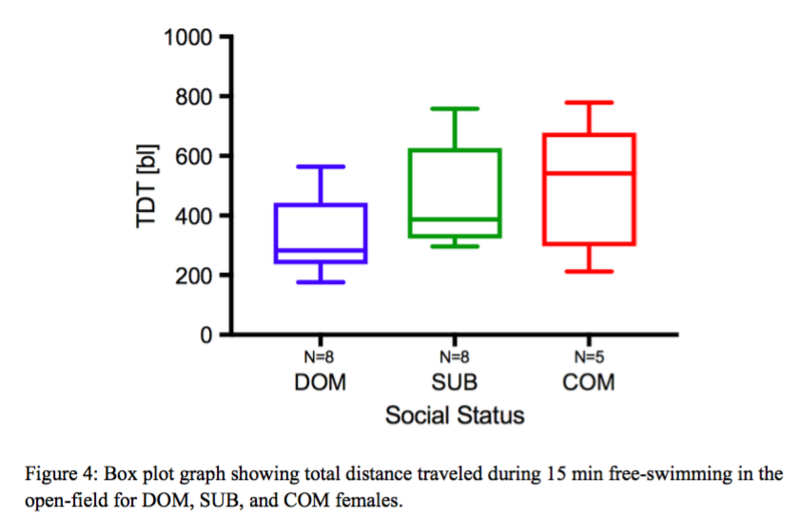 Descriptive statistics were run for each behavioral measure separated by social group, as DOM, SUB, and COM females. Data were tested for normality, and if normally distributed, a one-way analysis of variance (ANOVA) was applied to determine statistical difference amongst the three social groups. If the ANOVA produced significant results, a post-hoc Tukey test was used to determine significant differences between the social groups. If a measure did not follow a normal distribution, a nonparametric Kruskal-Wallis test was applied. Permitting that the Kruskal-Wallis test yielded significant results between the three subject groups, a post-hoc Dunn’s multiple comparisons test was run to determine which subjects had significant differences. To test for differences in thigmotaxis (wall hugging) between females of the various social groups, we measured the time animals spent in the center zone of the experimental tank during the 15 minute swimming period. As illustrated in figure 1, DOM (N = 8) and SUB (N = 8) females spend only a short amount of time in the center (mean: DOM 14.4 sec ±12.4 SEM; mean SUB 15.3sec ±12.3 SEM) when compared to COM (N = 5) female controls (mean COM 153.2 sec ±36.4 SEM). (H = 10.08, p = 0.0026, Kruskal-Wallis test). A post-hoc test demonstrated significance between DOMs and COMs, with an adjusted p-value of 0.0086, and SUBs and COMs, with an adjusted p-value of 0.0210 (Fig.1). Additionally, COM females visited the center zone more often (mean: 28 ±3.5 SEM) as compared to SUBs (mean 4.1 times ±5.9 SEM) and DOMs (mean: 4.5 times ±3.4 SEM), as indicated by figure 2. A statistically significant difference was found between the female groups (H = 7.185, p = 0.0209, Kruskal- Wallis test). Dunn’s tests produced an adjusted p-value of 0.0366 between DOM and COM females (Fig.2). DOMs showed increased latency, i.e. time to enter the center zone (mean: 419.2 s ±132.8 SEM) as compared to both SUB (mean: 185.9 s ±88.4 SEM) and COM females (mean: 175 s ±96.0 SEM), see figure 3. Measuring the time it took for the fish to enter the center zone (center latency), showed a non-significant trend for longer latencies in DOMs (mean: 419.2 s ± 132.8 SEM), compared to SUBs (mean: 185.9 s ± 88.4 SEM) and COMs (mean: 175 s ± 96.0 SEM). (H = 1.4, p = 0.5117, Kruskal-Wallis test; Fig. 3). 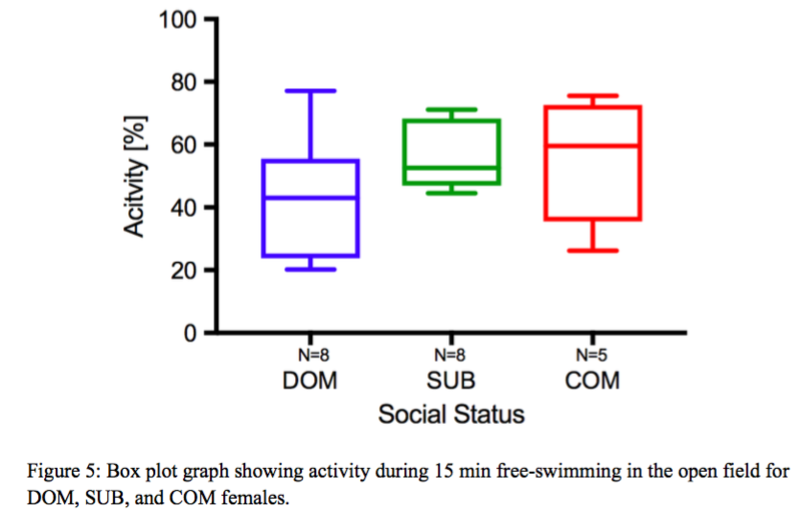 In order to test for differences in locomotion, total distance traveled and swimming activity was compared between the three female social groups. As illustrated in figure 4, COMs showed a non-significant trend of swimming longer distances (mean: 498.2 body lengths ±95.5 SEM) than SUB (mean: 458.9 body lengths ±60.3 SEM) and DOM females (mean: 327.5 body lengths ±46.1 SEM). In addition, COMs (mean: 55.2% activity ± 8.4 SEM) and SUBs (mean: 56.6% activity ±3.8 SEM) were more active than DOM females (mean: 43.4% activity ±6.9 SEM) during the 15 minute period analyzed as indicated in figure 5. However, no significant difference between social groups was found by the one-way ANOVA test for either TDT (F(2,18) = 1.98, p = 0.1670), or activity (F(2,18) = 1.431, p = 0.2651). This study tested if social defeat in A. burtoni females mediates anxiety-related behavior. DOM and SUB females both showed higher anxiety-related behavior measures compared to COM females from mixed-gender communities. These results contradict our hypothesis that social defeat in females would lead to an increase in anxiety, as seen previously in males in this species (Neumeister et al. 2017). 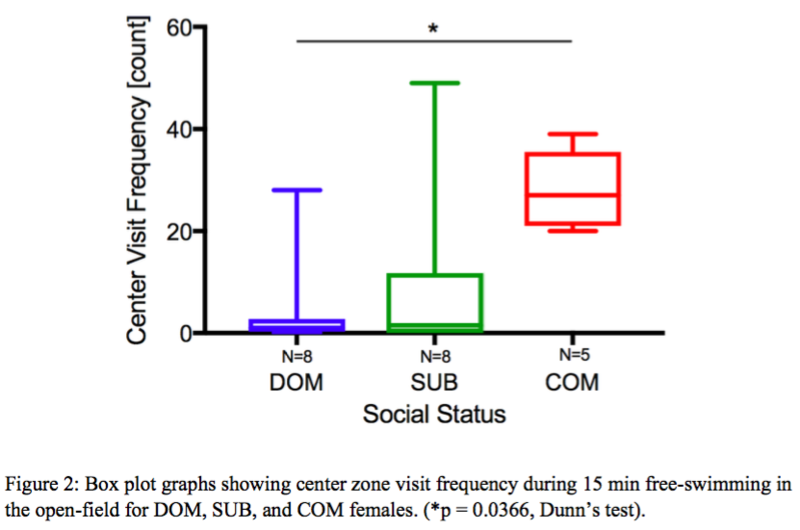 One explanation might be that the frequent antagonistic interaction of females (in female-only communities) provides an ongoing stressor for both DOMs and SUBs, which females in mixed-gender communities likely do not experience. Thus, community females would experience less threats and therefore be less anxious than females in communities without males. In mixed-gender communities SUB males are the main target of aggression from dominant males, thereby establishing a stable and distinct social hierarchy. This might explain why SUBs males show increased anxiety-related behaviors compared to DOM males (Neumeister, 2017; Fulmer et. al, 2017). In contrast, female social hierarchies are less stable, characterized by more frequent changes in social status (unpublished results). This might explain the insignifcant difference in the anxiety of DOM and SUB females from female-only communities. Another unexpected finding was that DOM females exhibited apparently longer center visit latencies than SUBs and COMs. This behavior might be interpreted as a strategy for predator avoidance. DOMs are larger and display bright coloration, and thus are at a greater risk for predation in the wild. In support of this notion, it is reported that DOM males show higher startle-escape responsiveness than SUB males (Neumeister et. al, 2010). However, DOM A. burtoni males have been found to spend more time in the open-field center compared to SUB males in open-field tests (Neumeister, 2017), again highlighting discrepencies between social phenotypes in males and females. Furthermore, the hierarchy in female-only communities represents an artificial environment that is unlikely to occur in the wild, which may account for behavioral differences between female and male social hierarchies. Trends in locomotor activity were insignificant between female social groups, which is likely due to small sample size. To better understand these behaviors, a larger sample size is necessary. 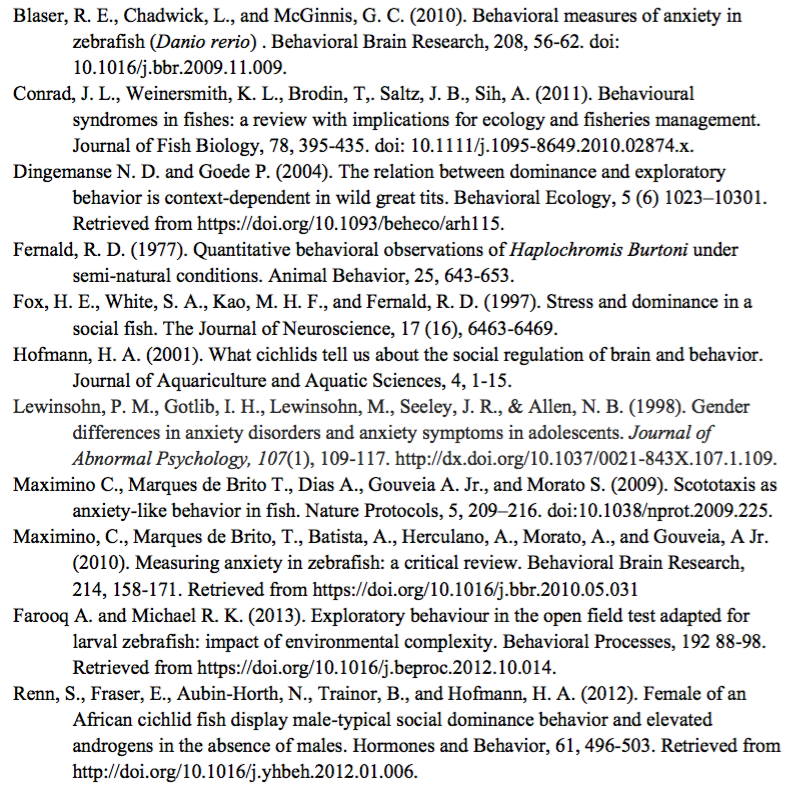 Future work will involve increasing the sample size of females, and comparing DOM and SUB phenotypic differences between females and males to explore how gender impacts anxiety responses. This research could have applications to treating anxiety disorders in humans, as gender differences are found in anxiety disorders, with females being more likely to experience anxiety disorders, and exhibiting different anxiety-related sympotoms than males (Lewinsohn et al., 1998). In addition, this research could be applied to improve institutional response to anxiety as it relates to agression in high stress, single-gender environments, such as girls/boys schools and prisons. Thank you to Prof. Thomas Preuss, for giving me the opportunity to work in his laboratory, and for mentoring me in my research. I also thank Dr. Heike Neumeister and Mila Adelmann for help with the design of the study and their mentorship. I also like to thank all other Preuss Lab members for their support and input to the study. Additionally, I acknowledge my teachers, Ms. Erin Schmitz and Mr. Lutz Holzinger, for fostering my interest in science and guiding me during this laboratory research experience.